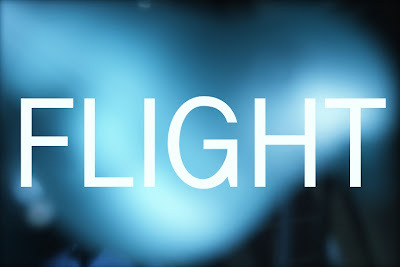 This week's word is "flight". Create a piece of jewelry, a work of art, or take a picture that, in your opinion, best captures the meaning of the word. Think about the word and its different interpretations and how it makes you feel. Translate it into whatever medium you'd like and then post about it on your blog. Once you've uploaded your blog post, copy and paste the URL into a new comment on this post. Be sure to check out what others are making, inspired by the weekly word. Don't delay; you have a week until the new word is posted. Interested in learning more about decopauging your jewelry projects? In response to a reader question, Lisa provides some info to help you get started. Tammy combines wire, chain, and crystal teardrops for some dramatic earrings. The ABS is serving up a free project courtesy of Ornamentea. Enter a jewelry, beading, or mixed media contest or challenge this spring. Michelle shares links to nearly a dozen opportunities. Carmi has a two part beaded sachet tuorial this week on her blog. This week's Tuesday Tangle is about taking up a challenge! Jean writes about a book she was given years ago concerning Elizabeth Taylor's astounding jewelry collection. Charlene creates earring from humble materials and simple design. To celebrate National Craft Month, Andrew guest blogs for Beaducation. 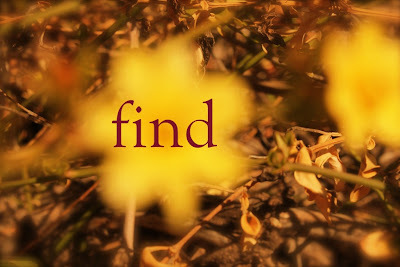 This week's word is "find". Create a piece of jewelry, a work of art, or take a picture that, in your opinion, best captures the meaning of the word. Think about the word and its different interpretations and how it makes you feel. Translate it into whatever medium you'd like and then post about it on your blog. Once you've uploaded your blog post, copy and paste the URL into a new comment on this post. Be sure to check out what others are making, inspired by the weekly word. Don't delay; you have a week until the new word is posted. Cindy’s been out with the flu so this week’s a rewind on spicing up your plain old packaging. I hate to do this, especially for the readers who tune in every day or even more frequently... but my blog is going dark. Not permanently, but for a week or so. I'm taking a small "Blog-Holiday". I've been promising myself a vacation from the internet for months. I think this week is a good week to do it. I can think and clean... settle back in and pray for this world. I insulate myself from the news because every time I see reports of child molesters or animal cruelty or nuclear meltdowns or ecological disasters... it breaks my heart. I know people who say, "it breaks my heart" at the drop of a pencil or the spill of some salt, but when I see entire countries devastated or ecosystems reduced to piles of black sludge... it truly and most profoundly breaks my heart. I spiral away into dark moods and deep sadness. So, I'm going to go away for awhile. It'll be good to reconnect to my home and spend time snuggling the cats. It'll be a treat to play with them until their pink paw-pads are rosy red, and most splendidly – to make things. I've already arranged for some posts to appear in my absence... so it'll be like I'm not completely gone. As far as my shop goes... orders will still go out. (Don't forget that there's a St. Patrick's Day sale still going on!) But I'm also taking a break from my email. So all correspondence will stop until I "go live" again. If you really need me, text me and alert me to your query. I'll respond back shortly. In just a few short hours, I'll be heading back home to Pennsylvania. I'll be leaving the desert behind, after having spent three months here. My time here has been magical. I do not know how else to describe it. I've grown to love it here and I know that part of me belongs in the land of blue skies and red earth. During my stay I have been really blessed. I have opened my heart to so many wonderful people, who I will cherish always. I made memories that I will never forget. I climbed mountains that part of me will forever stand atop. I walked paths that part of me will always linger. My time here hasn't been without challenges. Indeed there were times of frustration and soul-searching, but with a little bit of desert magic... no obstacle seemed too great. I leave here, with a renewed sense of purpose and a bit of that sunshine in my heart. Although I am looking forward to going home (it has been a long time since I've been there), I do so with a heavy heart. Tucson is such a beautiful place, filled with so many wonderful and creative people. I will miss everyone who I have gotten to know over these past three months. I most certainly will miss the desert magic, the web of energy that connects all things here... from the Copper's Hawk soaring above to the dusty rabbit below, from the feathered clouds up high to the spiky cacti all around.... I will miss this place. To celebrate St. Patrick's Day and this week's Weekly Word, I decided to have a sale in my Shop! From now through St. Patrick's Day (Thursday, March 17th) save 20% off everything in the shop (except classes). Use coupon code "lucky" to receive your discount... AND if you place an order during the Lucky Sale, you'll automatically receive a FREE lucky charm! CLICK HERE to visit my Shop to check out the full selection. I wanted to do at least one more "Tucson" thing before I headed back home. Dustin and I agreed to go on a hike. We thought that visiting Sabino Canyon and exploring the Seven Falls would be a nice last adventure. I loved it the last time I visited with the Capturing the Moment class and was excited to see the falls. Our walk began innocently enough and with a roadrunner sighting. I found a pocketful of petrified wood chunks and rough quartz crystals along the way. When we planned our trip (rather quickly) we couldn't find a map of Seven Falls. Of course, it could have been that we were looking in the wrong area. Instead, we went on hearsay. That it could be located at "the end of the tram line". Unfortunately, there was no mention of there being TWO tram lines. So, Dustin and I walked to the end of Sabino Canyon. This, in itself, is an approximately 4 mile walk. Once we got there, we couldn't find any signs of Seven Falls. Logically, it could not be that far away... right? Wrong. Snaking higher and higher, we walked onwards. We overlooked the valley below and could see everything... everything, that is, except for Seven Falls. Seven Falls lay beyond that humpback-shaped ridge in the photo above, aptly called Saddleback Ridge. We kept walking, thinking that we could soon relax by the cool water's edge. I kept saying, "It must be around this bend." Or, "It can't be too far." All the while, we went higher and higher. The trail became rougher and rougher, as we unknowingly headed into the Pusch Ridge Wilderness. Above is a picture of a bloom, taken on our descent down the canyon. I had suggested that we take a shortcut back, that following the creek would probably be an easier hike back. This, of course, as we would find would be incorrect. Above is a picture of Dustin overlooking what we thought was a dried out version of the falls. Making our way down to the creek wasn't easy. I wasn't wearing hiking boots and blisters were already starting to threaten. The way down was littered with loose boulders and spiky cacti. I had thought that once we got to the creek, we could make fast progress back in time to catch a shuttle. As we made our way through the tumble of stones, placed by the high waters of monsoon season, we reached an impasse. The walls of the canyon became dangerously steep and smooth and there was a drop down to a pool of water. Me with my expensive camera, did not want to jump into the freezing (questionable) water and potentially damage my said expensive camera. Nor did I really want to walk back in soggy sneakers. So we doubled back and tried to find an easier way back up to the trail. This is where things got dangerous. At one point I lost my footing on some loose gravel and grass, painfully banging my shins into a sharp drop, skidding down a few feet to stop abruptly on a lip and badly bruise my bottom. (My camera was fine if you were wondering.) I probably scared Dustin to death. I definitely scared myself. There was no turning back and we had to scale the ridge to make it back to the trail. I won't lie. There were some really scary parts, where I had to climb a sheer rock face without a harness. I worried that where I stuck my hands (and could not see) to grip, a rattlesnake might be sunning itself or I might find the burrow of a scorpion or happen to come across a mountain lion when I pulled myself up. Luckily, we made it back to the trail and we began our slow descent, back to the end of the tram line and then back to the trailhead where the truck was parked. My feet had blisters on top of blisters, my thighs ached and I had managed to twist my ankle. I told Dustin that if I ever suggest a shortcut again, to feel free to thwack me upside the head as a reminder of our hiking adventure and my near-death experience. Our walk was not without some reward. The views were amazing and we managed to catch the sunset, painting the canyon walls pink and burnt orange. Blocked by the ridge, cool, blue-green shadows arched. The stones that made up the creek bed became luminescent, shining white in the pale moonlight. The trees became vivid green in the coolness; the saguaro cactuses loomed like sentinels in the dark. Bats swam through the air, diving and twirling, as owls called and unknown creatures scuttled in the underbrush. The stars came out, speckling the sky with hundreds of points of light, and a ring circled the moon. 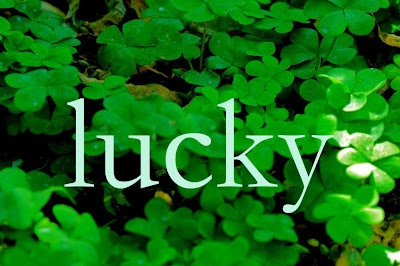 This week's word is "lucky". Create a piece of jewelry, a work of art, or take a picture that, in your opinion, best captures the meaning of the word. Think about the word and its different interpretations and how it makes you feel. Translate it into whatever medium you'd like and then post about it on your blog. Once you've uploaded your blog post, copy and paste the URL into a new comment on this post. Be sure to check out what others are making, inspired by the weekly word. Don't delay; you have a week until the new word is posted. Stop by and see the Art Bead Scene’s Monthly Challenge painting. It’s the perfect time to make your own luck with this lucky earring tutorial. Are you ready for gnomes? Lisa is getting a bit of spring fever and ready to get out the gnomes, gnome jewelry that is! Win a copy of two novels: Waking Up in the Land of Glitter and Miss Scarlet’s School of Patternless Sewing. In this week’s rewind, Cindy hammers home a point about tools. Inspired by Calder and Medieval crowns, Andrew sets out to create his own crown out of wire and Roman Glass. Spring is taking root and it's hard for me to even think about winter right now, but one of my pieces was featured recently in the Winter Enchantments Gallery on the Artbeads.com blog. CLICK HERE to see it and some other fine examples of winter-themed jewelry. I also wanted to take a brief moment to say that "Snowflowers" will be the last piece I'm creating for Artbeads.com as a Design Partner. Duchess (and Steve before her) were really great and very generous in providing me with creative challenges, using products on the Artbeads.com website. Time is short though and there are not enough hours in the day! If you're worried that you'll see less of my work: FEAR NOT! I'm working closely with some of the other online retailers to bring you more designs, spotlighting some really awesome products. I'll be sure to write more as the details emerge. I'm really looking forward to these new creative challenges with companies that I love whole-heartedly and am really excited to be working with! Beaducation is celebrating national Craft Month! I was asked to write a piece for their blog about Art vs. Craft and where things deviate and where they collide. It was an interesting task and I did it in under 1,400 words! Not an easy feat. (I feel as though this would make for an interesting book for someone to write – lots of material and places to theorize.) 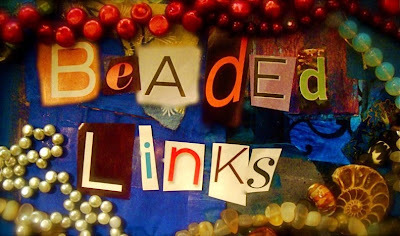 Check out the first installment of "A Revolution in Making" on the Beaducation blog by CLICKING HERE. In this post I discuss definitions and a brief history of Craft and even talk about my own personal experiences navigating the two worlds. For the second installment, CLICK HERE. In this part, I give examples of artists who tackle being "artists" AND "crafters". It's with great sadness that I write that artist and instructor, Ellsworth Ausby has passed away. He died on March 6th, 2011. He was my first painting teacher at The School of Visual Arts. I spent many hours in the studio under his instruction, learning about cast shadows, mixing paint, and "Ausby's Black" (a rich shade of black made with alizarin crimson and phthalo green). Even after our class ended, we still kept in contact. He wrote countless recommendation letters for me; finally he gave me a stack of twenty signed letters with the recipient line left blank. He said, "Thornton, don't use 'em all up in a week." Professor Ausby, a talented man of vision, always went above and beyond the call of duty. I remember the last time I saw him in person. He had surprised me before the opening of my senior thesis show. He came to personally congratulate me and tell me that he had been keeping tabs on my work and that he was proud of what I had accomplished. He was that kind of man. Days before I was scheduled to leave New York, an errand had taken me to Williamsburg. I remember climbing the stairs to the raised platform of the Marcy stop on the JMZ line and seeing a group of tourists admiring the stained glass pieces. While we waited for the train, they took pictures in front of the colorful, geometric cosmologies called, "A Space Odyssey". When the train finally arrived and we were boarding, I said to them, "I know that man – the man who made the art!" 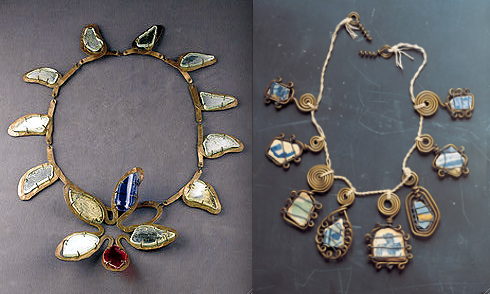 After I had posted about the crown I had made inspired by Calder and Medieval crowns (CLICK HERE to view the post), I began to really study the picture of the Calder necklace with the bits of wire-wrapped broken pottery. I allowed my eye to follow the lines and shapes – twisting, curling, looping. The next thing I knew, my hands were already picking up the wire! I knew that I had to try my hand at it. Instead of bits of broken pottery, I used undrilled ammonite slices that Baba, Dawn, Holly and I found while exploring a dusty tent during the Gem Shows. I think that they came out quite nicely! I like their roughness and the organic quality of the forms. I'm excited to adapt this to my own work. I can't count the times that I've wanted to set something but not had the tools. These wire bezels are fairly easy to make and don't require a lot of tools. (The heavy gauge wire is tricky to manipulate, but I found it much more pliable after annealing it.) It'll be interesting to see what I do now that I've added these to my repertoire. The idea of transformation and second lives has always interested me. Perhaps that's why I'm fond of the Greek myth of Daphne. She was being pursued by the sun god, Apollo, who had wanted her as a lover. She was not interested and fled. Just as he was about to catch her, she prayed to her father to grant her escape. Her prayer was granted and she was changed into a laurel tree – a tree that would live on forever, having its fragrant leaves and branches woven into crowns and presented as one of the highest honors to only the most worthy. I thought that this mythological character would translate into an excellent doll. I created a small acrylic painting, depicting Daphne in mid-transformation, to give the feel of the doll. (Unfortunately the picture does not capture the iridescent and metallic pigments.) I imagine one of your porcelain dolls, inscribed and adorned with swirling, wood grain markings. She's wearing a crown and bracelets made of tiny, dangling leaves. I think she'd make a beautiful and unique addition to the works of art you've already created. I've been pouring over the Calder Jewelry book. It's a fantastic resource and has been very inspiring. I was really drawn to the pieces where Calder incorporated found objects into his work. I think there's a magic in elevating something "mundane" turning it into something truly divine. Above are some examples of the pieces that sparked my creativity in my latest Calder-inspired piece. He took ordinary pieces of glass, mirror and broken pottery and transformed them into really gorgeous works of wearable art. 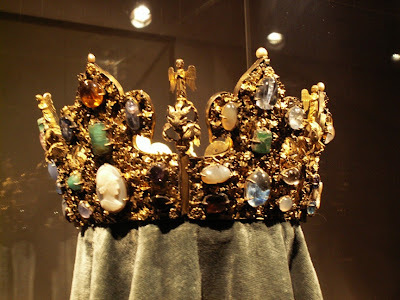 Medieval Crown from the National Treasury in Munich; picture by Sue Carbary. The piece that I created was also inspired by Medieval crowns set with jewels and other objects. I love the rich patterning of the set stones. 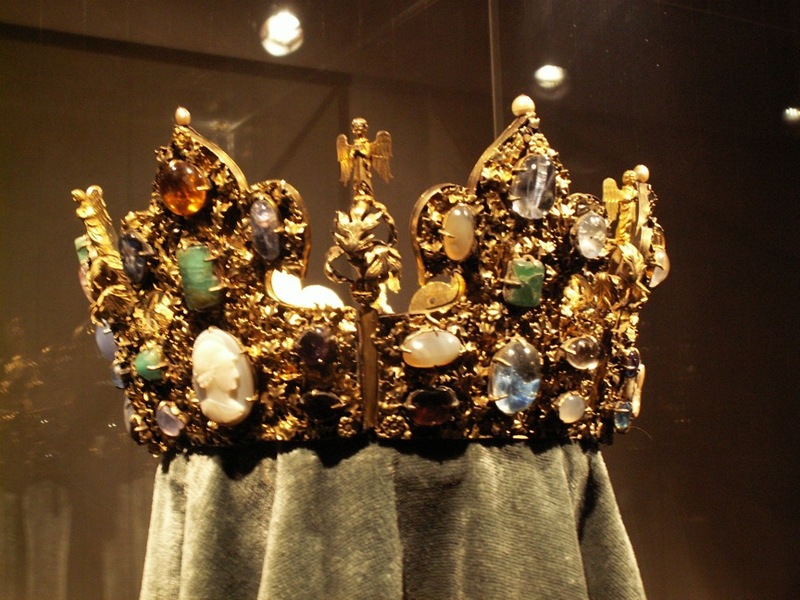 During the Byzantine era, Justinian and Theodora, made it illegal for anyone but royalty to own precious jewels. If you look at the mosaics in Ravenna, it is clear to see the effect: the consolidation of an empire's wealth in one place and a clear distinction of status. The above crown is what I made. I used the same techniques I used creating the wire-woven pendants also inspired by Calder. CLICK HERE to see the post about them. 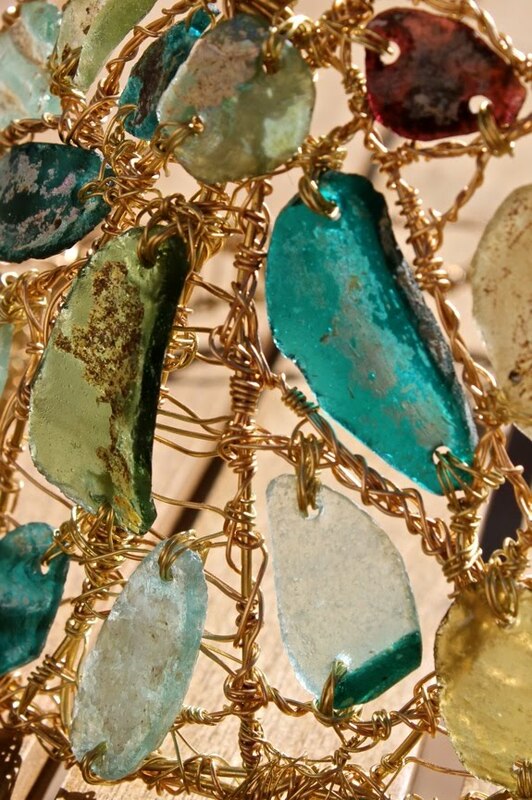 The frame of the crown is made of woven brass and bronze wire and is embellished by pieces of Roman Glass. The pieces of the excavated Roman Glass still have traces of their unearthing and glitter with the iridescence of being ancient. Some float in an inlay design and others are wired on top of the woven, structural parts of the crown. It's relatively "small" for a crown and is meant to sit, perched atop a head... almost tiara-style. I call it, "The Pauper's Crown". It's interesting to note that many of the jewelry pieces made by Calder out of wire and small bits of metal were because he was working with scraps from his bigger sculptures or that it was during wartime and metal was hard to come by. So, it's not just about replicating the feel of "primitive" art or ethnic body adornment, but that he was working with what was available. I also gave it that title, because while Roman Glass is certainly pricey nowadays, the glass comes from ancient dumps. 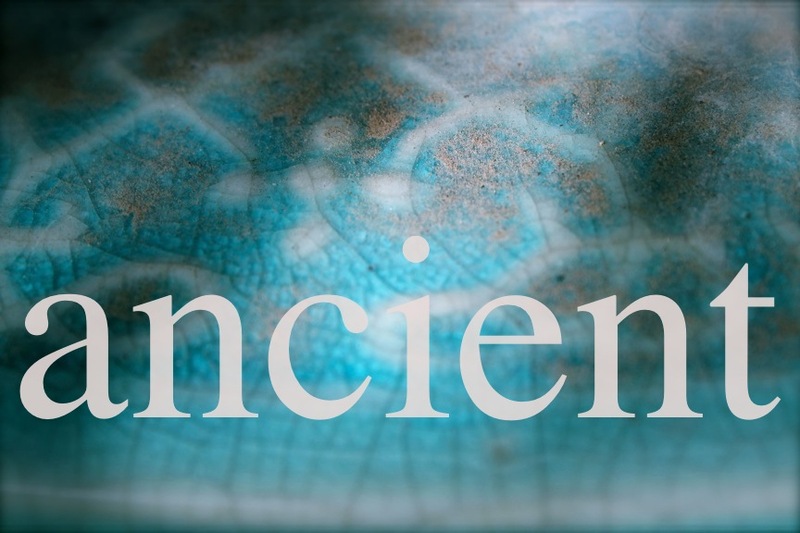 I love that something thrown away, millennia ago, is finding a cherished second life. We treasure it because it is rare and ancient and relatively expensive; its beauty comes from being old. Above is a detail of the wired Roman Glass. I don't think the pictures do the glass justice, as there is a shimmer on the glass that simply refused to be captured by the camera today. One of the things that I really liked about creating this particular Calder-inspired piece is that it gave my arms and ears a rest from the hammering. It's true that the wire can be hard on the hands, especially with all the weaving, but it was significantly more quiet. I was also able to make this crown come to life with simple tools and supplies already on-hand. I felt all like Calder, using what was around. 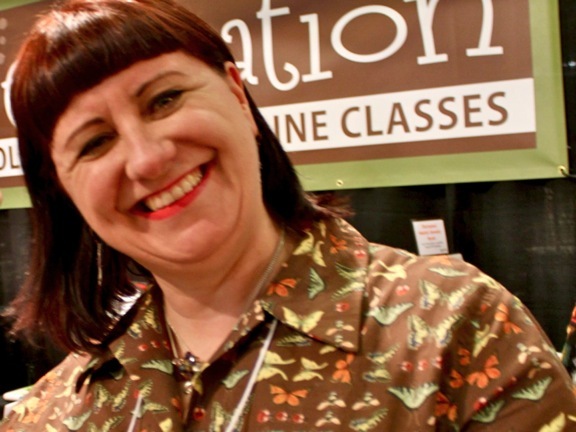 Kate Richbourg, a California-based jewelry artist (with over 19 years of beading experience), former bead shop owner, and educator, puts her talents to use as the Educational Director of Beaducation. Beaducation, started by Lisa Niven Kelly, is an online resource for affordable, virtual jewelry-making classes and supplies. CLICK HERE to visit the website. CLICK HERE to check out Kate's blog, "We Can Make That at Home". Andrew Thornton: You're currently the educational director of Beaducation, what does that entail? How did you first get involved with beads? Kate Richbourg: The Director of Education post involves all things, well, educational at Beaducation. I am in charge of the online video class program. That means finding instructors and choosing classes that will be of interest to our customers. I direct the actual class shoot and make sure that the class translates to video. Obviously with video classes the students and instructor are not in the room at the same time, so we have to anticipate what questions the students are going to have and at what point in the class they might have them. That's a big part of filming those classes...how does it translate for the student at home. There are a lot more steps involved in getting that class from our studio to video, so thankfully we have a super team that supports that process. In addition, I support our customer service team and inventory team on product knowledge. I cover the "how-to", "what's this for" and "what should I use" questions that we get from customers. If someone gets stuck with a class or has a question about tool use, I'm your gal. I am also (usually) the fingers behind the keyboard for our social media outlets. I FB, Twitter and blog. I try and keep up on what's happening in beading cyberspace. And I can't forget tradeshows...I am usually the "Demo Girl" at the shows that we do during the year (not too many, thank goodness!) I love to connect with customers during demos. It really shows what people are into and what the hot topics in jewelry-making are. How I got started in this industry was really by chance. After I graduated from college (as a Theater Arts Major) I had a slight panic that I wasn't going off to an office job. After a brief stint in a traditional office job I realized that corporate lifestyle wasn't for me. So I did what many people do when they are at a crossroads...I decided to go back to school. I figured that I would become a teacher. I loved to teach. I taught theater programs for kids during my college years and I loved the teaching dynamic. LOVED IT! I just figured that's what I would do...so while looking through the want ads (remember those? This was the early '90's) I saw an ad that said "Bead Store Asistant Manager Wanted." Whoa. A BEAD store? A store that just sells beads. I'm gonna call them, NOW! I figured that would be a good part-time job while going back to school. So I called, interviewed and got the job. I never went back to school, but I found my calling. That store was The Bead Shop in Palo Alto CA. After taking every class that was offered (we had about 4 or 5, all stringing) I was hooked on beads. Our Class director left not long after I started and I was offered the position. I never looked back. We had an amazing class program and I am proud to say that we gave many beaders their start. AT: You were once the owner of a bead store called, Beadissimo in San Francisco that was open for almost six years. It has since closed. What was it like to own a bead store? What happened to prompt its closing? Do you wish you could change anything? KR: Well, every bird must leave the nest, I suppose. After ten years at The Bead Shop, I was ready to strike out on my own. I really had a clear vision of what I wanted a store to be. From the very start my focus was the customer. I wanted to create a space that people would feel comfortable in and offer interesting beads, great staff and fantastic classes in a beautiful classroom. I loved it. We really thrived and became a creative linchpin in the beading community. In the middle of year six, that's when the economy really took a downturn. We went from being a really busy store to a ghost town. The creative arts really took a dive. Maintaining a small business in a struggling economy became very difficult. I made the very, very tough decision to close the doors before things became really dire. Now that it is all over, I am not sure that I would change anything. I think is just ran it's natural course. I do miss it. Not all of it, but the customer interaction part of it...the classroom part, the employing people and creative community part, that's what I miss. But let me tell you. I was SUPER LUCKY to have landed here at Beaducation. Lisa Niven Kelly is one smart cookie and I am proud to be a part of her team. AT: Beadissimo was known for its classes and bringing in talented artists from all over the globe to teach. As the educational director of an online jewelry-making educational site, do you see similarities between your positions? What are the major differences? KR: Well, now classes can reach the student wherever they are. No one has to jump on a plane or hop in a car to get to class. They just have to click their mouse. Students still want the same thing, great classes, knowledgeable instructors interesting projects. Now the challenge really is to translate that class experience for the computer screen. We get better all the time. With each class we learn a lesson on how to make this online experience better. AT: Do you still have time for your own work? KR: It's a struggle, for sure. There were a lot of years that I really didn't make jewelry much at all. Only a quick class sample or pieces for the store. I finally feel like I have come out of the fog, you know. Worry and pressure take away a lot of your creative spirit. But it is coming back. It's knocking on the door and I am throwing that door wide open. AT: What are your biggest influences in your personal work? 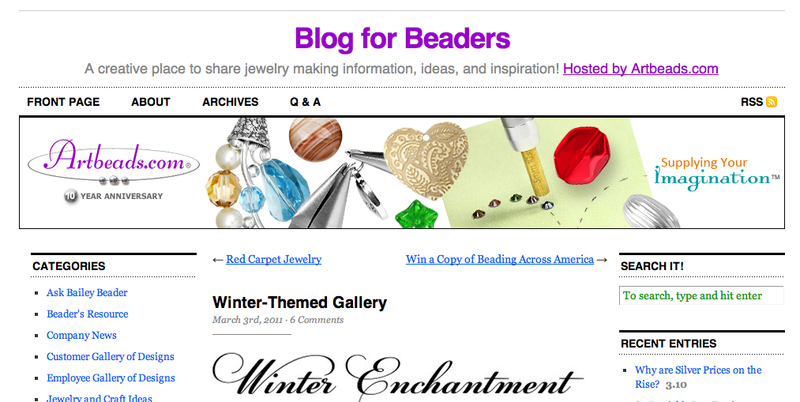 What do you like best about the beading community? KR:There are so many people that I admire. What I think is really great is that even though this business has really grown and evolved in the 19 years that I have been doing this, it still seems relatively small. I really admire the tenacity of the people in the business, from students to other business owners. There is a feeling of "we are all in this together"...that's what really inspires me. It feels old-fashioned. And that's a good thing in my book. AT: What's next? Are there any interesting things on the horizon or projects that you're looking forward to? KR: I am really looking forward to the new classes that we have coming up on Beaducation. Great classes, great instructors. We have great things brewing this year. On a personal level I am really excited and honored to be writing my first book. It is coming out in the Fall of 2012. Let me just say that I hope to bring metalsmithing to all...if you can string a bead, you can wield a torch. The winner for this past week's Thursday Giveaway featuring ceramic components from Golem Studio and flexible beading wire from Soft Flex Company is Shaiha. Congratulations! Please send me your address and I'll put your prize in the post! Be on the look on Thursday for another chance to win! This week's word is "ancient". Create a piece of jewelry, a work of art, or take a picture that, in your opinion, best captures the meaning of the word. Think about the word and its different interpretations and how it makes you feel. Translate it into whatever medium you'd like and then post about it on your blog. Once you've uploaded your blog post, copy and paste the URL into a new comment on this post. Be sure to check out what others are making, inspired by the weekly word. Don't delay; you have a week until the new word is posted. Since there were so many participants, The Bead Soup Party is still in full swing, thanks to the efforts of the fabulous Lori Anderson! Melanie shares her Bead Soup project, made with a shimmery upcycled key and keyplate from her new Earthen Oxide website mixed with some wonderful lampworked glass by MJRbeads. Andrew sits down with the fine folks of Beadaholique to answer a few questions. Check out his interview!